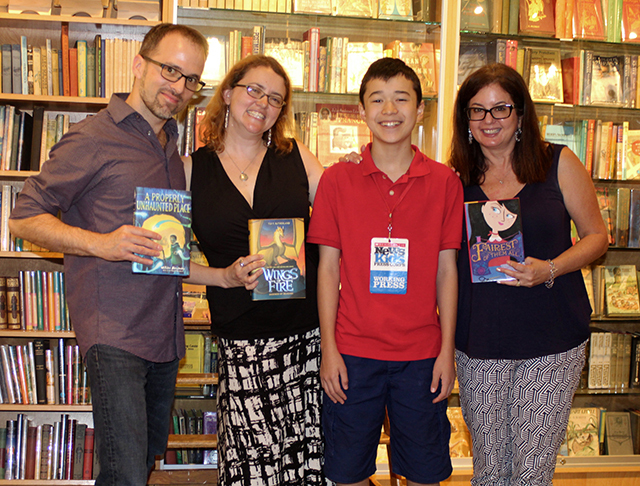 The Wonder of Fantasy Books | Kid Reporters' Notebook | Scholastic Inc.
Last August, Books of Wonder, a children’s bookstore in New York City, hosted a panel of three middle-grade fantasy authors: William Alexander, Sarah Darer Littman, and Tui T. Sutherland. Alexander had just published A Properly Unhaunted Place (Margaret K. McElderry Books), a novel about two kids who try to save their town by bringing back its ghosts. “It’s all sorts of weirdness and half-formed thoughts about our relationship to history and how it haunts us,” Alexander said. William Alexander: I think of it as a road trip, and I sort of know where I’m going. Now that I have deadlines, I need to have a plan that allows me to finish on time. Sarah Darer Littman: I’m more of a pantser. I’m good at dialogue and character. I tried to teach myself to be a better plotter by reading books on how to write screenplays. I also work for hire, which means that I write books in a series under a pseudonym. Tui T. Sutherland: I have enough of an idea, but I’m not a plotter. I don’t recommend that method for a 15-book series. [She laughs.] I try to make my books as surprising and interesting as possible, so I like not knowing. How do your personal ethics guide your writing? Alexander: Fantasy has an astonishing way of working out a moral question without putting a moral lesson at the end of it. The worst way to teach history is to teach it like it’s over. It’s an invitation to a conversation. Littman: Librarians made me a reader, writer, and thinker. Through literature, we can think about how we would behave in certain situations and the choices we would make. We can read about things and discuss them rather than pretend they are not there. We should not be in denial about difficult things. Sutherland: I want the reader to put themselves in other people’s shoes. I like to write about kind boys and fierce girls because I think they are the most interesting. I make them to be the characters who will rule the world someday. Alexander: Read wildly. Read genres that you’re not familiar with. Read outside of what you want to write because that’s when sparks fly. You can learn a lot from the theater and role-playing different characters. Littman: Always be curious. I write books to answer questions that I have. I like the gray areas, the difficult choices that we make when it’s hard and might even put us in danger. Sutherland: Read a lot. Figure out what you love. Writing fan fiction, writing in other voices, is useful as an exercise. Anything that gets you writing is good practice. I like exploring questions about what motivates people.